First off, I want to thank everyone for continuing to check out this blog. I know I have not been the best little blogger lately, but things have gotten busy around here and sometimes the things you love to do the most are the things that you don't get to do as often. It is a shame, but you do what ya gotta do! So, thank you to everyone that has left a comment and kept coming back for more. It is really nice to know you are out there! Now, for the good stuff. I have been thinking about this recipe for quite a while and the kids were completely on board for helping with the eating of these gems! 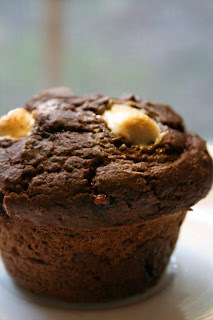 Miss Veggiegirl is who we have to thank for these S'more Muffins. I was a little worried that I would be busted for the whole wheat flour, but no one said a word. In fact, even the illustrator gave it a big thumbs up and he can always tell if there is a lot of whole wheat flour in something. So, I highly recommend these. I only made a few changes...1)from Jay, my oldest more chocolate chips (I doubled it and he wanted more! ), 2)oh yeah, I used cocoa and dairy free chocolate chips and 3)I used white whole wheat flour. So, dare I say these were healthy and in such a sneaky way! Shhh...don't tell! I'm THRILLED that you loved those muffins - hooray! They were more than loved! Thank you, Liz for the recipe! Wow. These look really good and I just happen to have some leftover marshmallows at home!